The great state of Maryland has more than 125 public golf courses. The Upper Chesapeake Region, “Gateway to the Chesapeake Bay,” is not only home to the blue crab and the great blue heron; it also has some of the finest golf courses in the Mid-Atlantic region. That makes it your best bet for a memorable and challenging golf package experience! The shining jewel of this destination is Bulle Rock Golf Course in Harve de Grace. 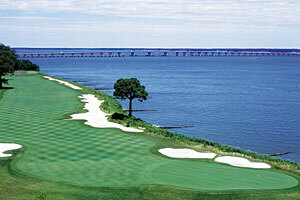 The Ocean City area boasts 17 championship courses designed by the legends of the game, Jack Nicklaus. Arthur Hills. Gary Player. Pete and P.B. Dye. Dr. Michael Hurdzan and others. Courses that have been recognized by Golfweek, Golf Digest, and – most importantly – by golfers of all skill levels, who delight in the challenging holes and beautiful settings. The Eastern Shore is highlighted by the wonderful Hyatt River Marsh golf course, consistently ranked as one of Maryland's best. The classic design incorporates challenging elements including sculpted bunkers and mature trees but balances them with wide, player-friendly fairways and inviting greens. Water has a prominent presence on the course with Shoal Creek meandering through the course and the Choptank River serving as a backdrop to many of the greens. Many of the Frederick area golf courses are carved out and around mountain slopes and rolling terrains, use elevations to their advantage (your disadvantage), and require straight-away shots while also providing breath-taking panoramic views of the Appalachian and Catoctin Mountains.